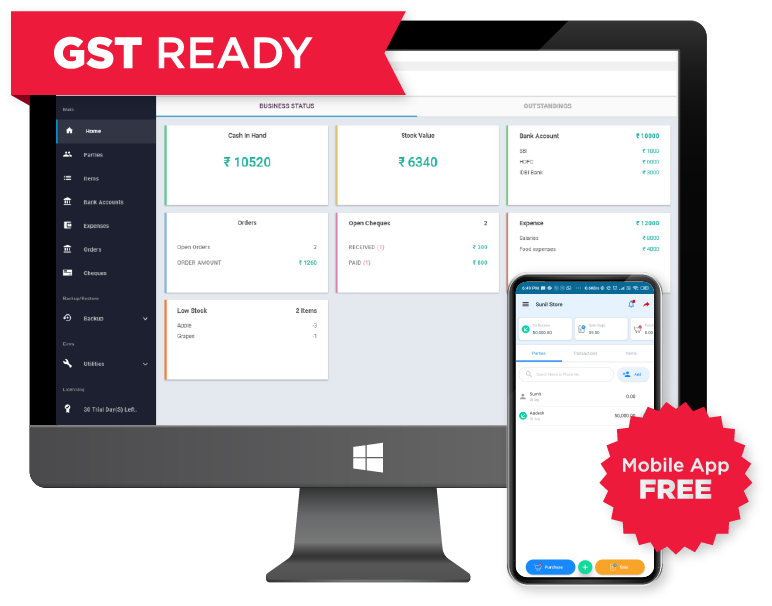 Vyapar is a FREE Business Accounting Software made for Indian Small Businessmen to deal with invoicing, inventory, accounting needs, and much more! The goal is to make a businessman’s daily routine less tiring and let them focus more on growing their business, less on paperwork. Even today, 70% SMEs in India still create bills on paper. Being that, most of their productive time is consumed in making manual entries and calculations. When small things go wrong, the entire business goes down, simply because there is no place to fall back. Not having the resources can really wear out the business owner driving them away from doing what matters most. Small Business Accounting needs a Digital Upgrade. An upgrade that is simple yet effcient. We are trying to bring in a simpler solution that works for them and hence VYAPAR! "We are talking about improving the life of a segment that is the largest in our nation, i.e ‘Small Business Sector’ the heartbeat of our economy. One of the major aspect holding down the small and medium enterprise (SME) sector is that they hardly have any access to proper technology. Easing this situation will go a long way in nurturing and sustaining SMEs. To let India emerge as one of the brightest economic spots in the coming years, businesses should focus on ways to make cash rather than stuck up in counting cash. Vyapar basically helps them do business accounting easier with the modern digital way!" - Sumit Agarwal, CEO, Vyapar. A Business Accounting App like Vyapar (available both as Android/Desktop App) most importantly sets up the business financial data at all times 100% accurately . It works offline, helping one use it without being connected to unreliable internet. Vyapar App paints the picture of what they own (assets), how much they owe (liabilities) and what are their business values (equity). It serves as a basis for proper planning of the business accounting activities. Manage all parties in one single place and market business much easily. View how business is performing instantly. Set up “Auto Backup” and secure his business accounting data against accidental data loss. Track and control individual units of an item by their expiry dates, batch no to pick right ones for upcoming sale. Do business accounting offine without internet. First version of Vyapar app (Mobile). Hiring key roles to build a great team. Official launch of the website (www.vyaparapp.in). Funded by renowned Investors of India. Vyapar supports "Auto Sync" feature (BETA version). Vyapar launched “Hindi” version of Mobile App. We’re thrilled that Vyapar has been recognized by Indian Businessmen who have taken it up and made it a success as a result of which we’re running towards 1 Million installs on play store. We hope "Vyapar App" continues to ease the life of our Indian businessmen. securityYour data is safe with us. It is only to make your experience with Vyapar better.